Screen shot of map of violent incidents in Baltimore near site of Freddie Gray protests on Monday, April 28, 2015. (http://nytimes.com via Twitter). 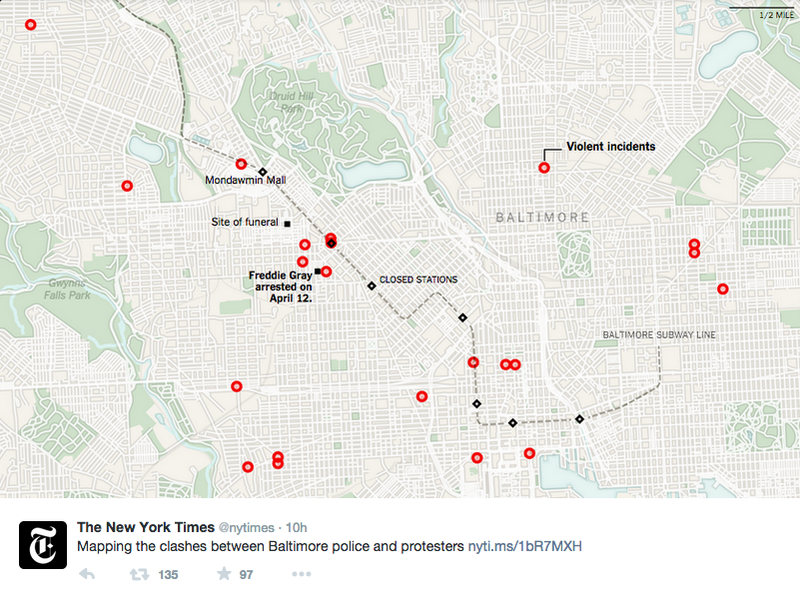 What happened in Baltimore on Monday wasn’t a riot. Let me repeat that. The violence that broke on in Baltimore a day and a half ago was NOT a riot. Nor was it a referendum on Black violence. Nor was it a microcosm of Black youth as “thugs.” Nor was it “violent clashes between police and protestors,” at least not in any formal sense. It was random violence and vandalism, spread out far enough to be, sadly, a typical week in an impoverished Baltimore neighborhood, as part of larger impoverished and divided city. Period. Exhibit A of media coverage, Erin Burnett, CNN, April 28, 2015. (http://Gawker.com). The Baltimore coverage has been a caustic cocktail so far. One of a media with bipolar disorder, bouncing from ignoring Freddie Gray’s death and the first protests during the White House Correspondence Dinner to wall-to-wall coverage for the past two days. Combine that with the inaction on moving forward with disciplining or arresting the Baltimore PD officers involved in making Freddie Gray paralyzed and dead. Combine that with the Black Respectability Police yammering on as if vandalism is simply an issue of undisciplined youth. Mix that with White columnists and commentators spewing racial stereotypes like a sewer hole. And you get the same numbskull presentation of a situation in which the questions are about how a handful in a community responded in snapshot to years of oppression, neglect, ignoring and ignorance. 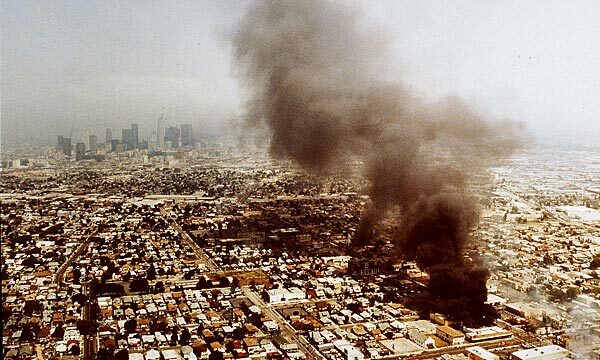 Overhead shot of L.A. riots, contrast between South Central LA fires and downtown LA smog, April 30, 1992. (http://latimes.com). Twenty-three years ago today, half-a-lifetime ago for me, the L.A. riots began, within a couple of hours of the first verdict in the Rodney King case. You know, the one where that all-White Simi Valley jury made up of retired cops acquitted the police officers involved of all charges. That was a riot, in every sense of the word. It was organized, it was disorganized, it went on for days, it took out whole city blocks, it left 53 dead, more than 2,000 injured, and the police and the National Guard arrested more than 11,000 people. Watching that unfold was a traumatic experience. It was the kind of experience that should make people — especially in the news business — remember that not every act of violence that occurs during a protest is part of that protest or constitutes a riot. By labeling what happened on Monday in Baltimore a “riot” is insulting to anyone with a long memory. Seven fires, a few clashes, a handful of burned out and bashed in vehicles. Heck, where I grew up, in “Money Earnin'” Mount Vernon, New York, that’s a bad weekend in December ’99. But it’s not a riot. Vancouver Canucks fans riot after team’s Stanley Cup Finals Game 7 defeat, June 16, 2011. (Reuters via http://theguardian.com). I’ll tell you something else. The media, the respectability police, and Whites in denial want nothing more than to make the Freddie Gray killing and the protests a besides-the-point news story. For them, making Blacks look less than human is the story. For them, any imperfection, any violence, any sense of the full range of humanity on display when under systemic oppression, is reason to celebrate. Because it means they can spend another day living in their matrix, where all their racism and race-based privilege is confirmed.